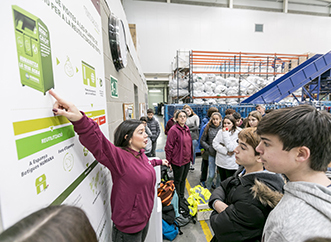 As a complement to our awareness-raising work, we have a Visits to Plant Preparation for the Reuse of Textile Residues of Ametlla del Vallés, Leganés (Madrid) and Valderrubio (Granada), which is part of the 'Tejidos Educativos' Sensitization Program. The objective is to publicize our preparation work for the reuse of the used textile. Visits consist of planned routes that seek to convey the transparency of our actions and strengthen relationships with our collaborating entities. "We did not know everything that is done with the clothes we give. We did not know what is behind our donations or the scope of the work you do, "confessed Marta Lloret, professor at the Institute of Vilablareix (Girona), after visiting our preparation plant for the reuse of Ametlla del Vallès (Barcelona). A hundred students from the center have participated in our Program of Visits, with which we want to open the doors of our equipment to society. It is aimed at institutions, organizations and companies that have an interest in our work, with special attention to our public and private collaborators. Also to schools with anxiety to develop actions with their students in which the second life of the clothes are protagonists. Humana's relationship with Vilablareix goes back to 2015: in this small municipality of Gerona, the selective collection of waste is done door to door. The textile fraction joined this system two years ago and, since then, neighbors and neighbors know that they can leave their clothing bag used on their portal on the first Monday of each month (it is added one more day in high season ). 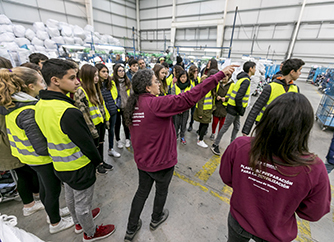 Recently, from the institute they expressed their interest in knowing where the clothes they donated were going to stop, which led to a visit to our plant for preparation for reuse, coordinated with Vilablareix Town Hall. Divided into groups and accompanied by their tutors and members of the Visit Program, boys and girls of 12 and 13 years (around 100 in total) learned that donated clothing is managed by a team of professionals to ensure that the garments have the best possible destination to be reused according to their characteristics, quality and status. The first is reuse, either through our secondhand stores or through its export (mainly to Africa: the local partners of the Foundation - also non-profit organizations - sell it at market prices in the countries of destination to generate resources for development cooperation). Another part of the clothing is in a state that does not allow its reuse so it is sold to textile recycling companies to take advantage of the raw material for the manufacture of products such as blankets and rags. A small fraction is about non-textile residues, which are derived from the corresponding authorized managers, while another percentage of clothing is used for Residual Derivative Fuel (CDR) with the help of specialized companies. A final part is sent to final treatment (landfill) because it is composed of material that can not be reused or recycled given its state. 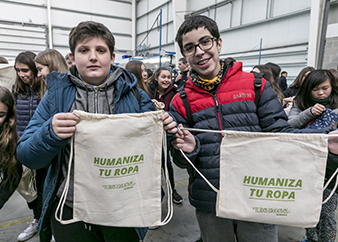 In the case of the educational centers, the visit is completed with the workshop "Hay Ropa Tendida" whose purpose is to spread the importance of the prevention of waste and the reuse of the used textile, its relation with the global sustainability, the protection of the environment and development cooperation. It also seeks to bring the environmental and social problems related to clothes to a family audience, as well as the benefits of acquiring prevention and reuse habits, and promoting their participation and collaboration.